Crousti food is in the form of tasty dry pet food, whose shape and size are perfectly adapted to your pet and are developed to offer him a balanced and appetising meal. Linseed is rich in essential omega 3 which preserve a beautiful coat and healthy skin (Crousti Adulte, Crousti Tonic, Crousti Senior Light, Crousti Junior). A high and balanced content in proteins and oils and fats to meet nutritional requirements (Crousti Junior). Beet pulp provides soluble fibres necessary for good digestion (Crousti Adulte, Crousti Tonic, Crousti Junior). Broad bean ‑ fibres ensure sufficient quantity (Crousti Senior Light). Fructooligosaccharides prebiotics have a beneficial effect on digestive flora (Crousti Tonic, Crousti Junior). Crousti Junior is a complete and balanced dryfood for puppies. It provides your puppy with all of the nutrients and energy it needs to grow. 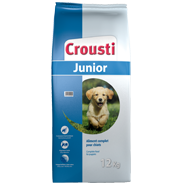 Crousti Junior: dog food full of the vitamins and minerals that make up a balanced diet. 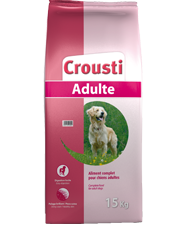 Crousti Adulte is a complete and balanced dryfood for adult dogs. It provides your pet with all of the nutrients and energy it needs to remain in top condition. Crousti Adulte: dog food full of the vitamins and minerals that make up a balanced diet. Crousti Tonic is a complete dryfood, perfectly balanced and containing all that a highly active dog needs. It provides your dog with all of the nutrients and energy it needs to remain in top condition. 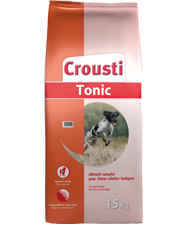 Crousti Tonic: dog food full of the vitamins and minerals that make up a balanced diet. Complete food for dogs aged 7 years and older and/or susceptible to gaining weight. 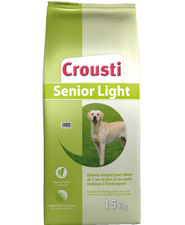 Crousti Senior Light is a complete dryfood, perfectly balanced for older dogs an/or dogs susceptible to weight gain. It provides your dog with enough food for good health, while limiting weight gain. Crousti Senior Light: dog food full of the vitamins and minerals that are essential for a balanced diet. 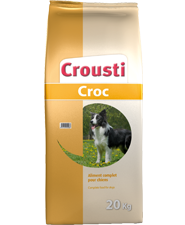 Crousti Croc is a complete and balanced dryfood for adult dogs. It provides all of the nutrients your dog needs. Crousti Croc: dog food full of the vitamins and minerals that make up a balanced diet. Complete mixed food for adult cats, rich in meat and with vegetables. Crousti Cat Meat (CROUSTI CAT VIANDES) is complete, balanced cat dryfood, rich in meat and with vegetables. It provides your cat with all of the nutrients that are essential to its daily life. Crousti Cat Meat (CROUSTI CAT VIANDES) is mixed food, tastes delicious and suits any type of cat. 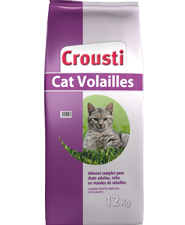 Crousti Cat Poultry (CROUSTI CAT VOLAILLES) complete cat dryfood is perfectly balanced and rich in meat of poultry. It provides your cat with all of the nutrients that are essential to its daily life. 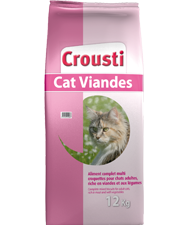 Crousti Cat Poultry (CROUSTI CAT VOLAILLES) tastes delicious and suits any type of cat.